Learn how to add an email template and set up appointment reminders. Email templates are used in many different areas in Studio Ninja. By default, we provide five email templates that cannot be deleted because they are linked to specific common tasks. For example, the 'Contract email template' automatically appears when you are sending a contract. Same applies for all the other default email templates. 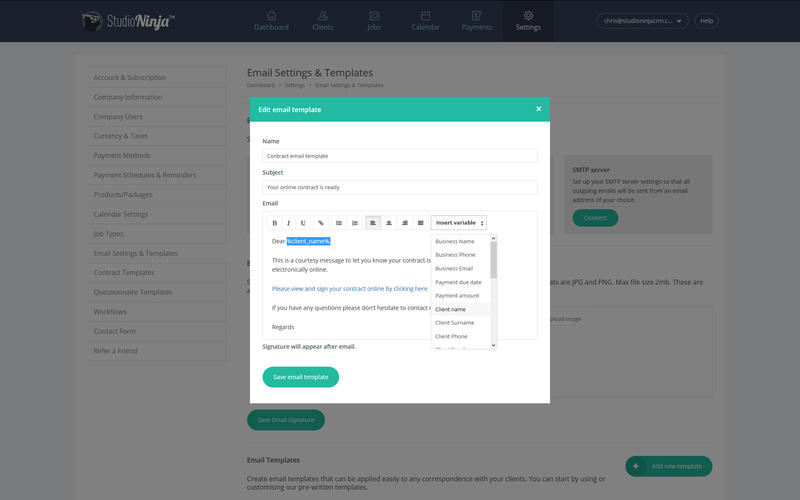 You can edit our default email templates and make them sound more on brand for your business. Just click the 'Edit' button, make whatever changes you like and click 'Save'. IMPORTANT: Do not remove the link within the email. This link must remain in the email so your client can click the link and navigate to their client portal and do the task that you are asking them to do. You can also attach files (photos, PDF, docs, etc.) when sending an email. Click on the 'Paper clip' button to attach a file. Attachments have a 10mb limit. Feel free to create as many email templates as you like. They are a great way to quickly correspond with your clients. 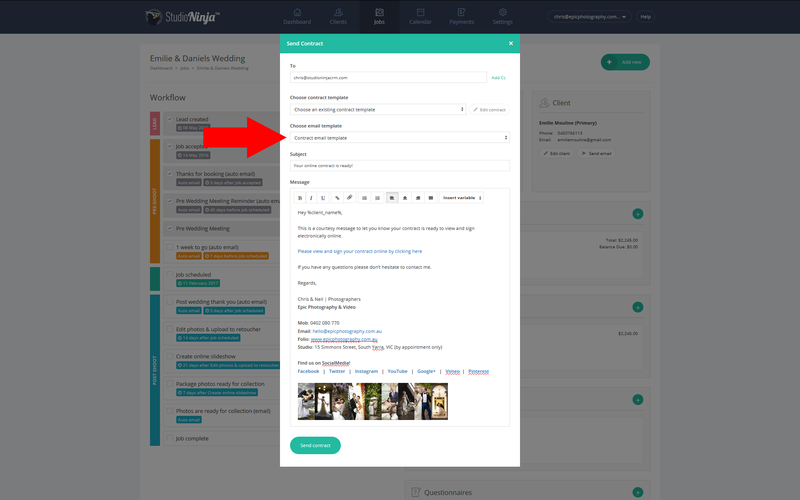 You can also add your email templates into workflow tasks and make Studio Ninja automatically send emails for you. Click here to learn more about workflows. There is also a list of 'Variables' that you can use in your email templates. Variables pull data from Studio Ninja and automatically insert it into your emails. For example, if you use the variable "Dear %client_name%", then when you send the email, the words will appear as "Dear Jenny" (if the clients name is Jenny). Appointment reminders are a great way to automatically remind your clients for any upcoming appointments. IMPORTANT: Do NOT remove the variables %appointment_date% and %appointment_time% OR make sure to include them when editing the message. These variables will show the date and time of the appointment.